Here in western Michigan we experience extremes in weather conditions that often make nature photography difficult. High winds, driving rain, single digit temperatures and seemingly perpetual lake effect snow. Our current extended winter this year presents a good time to talk about an alternative form of photography to attenuate the symptoms of cabin fever. On an impulse last summer, I purchased what is referred to a “game” or “trail” camera for $100. I’d been considering one for some time and purchased it for a couple of reasons. I wanted to evaluate animal activity and diversity on my wooded property and I saw it as a way to supplement my interest in wildlife photography with HD video. For my purpose the name “trail” or “game” is a misnomer. What you prefer to call the camera depends on how you think out of the box. It might be a feeder camera, a garbage can camera, an I-wonder-what-dug-that-hole-camera or even a what’s-that-in-the- attic camera. It’s an automated digital camera that can be left out in the elements to photograph or video record any warm object that passes by. Sure, it eliminates the outdoor experience but there are occasional outdoor experiences that are not practical. Being in two places at once or exposing your expensive equipment to serious environmental hazards, are a couple of examples. A conventional camera with an expensive telephoto lens, can’t be in one location day and night for days on end to capture anything that passes by. I’ve found, however that an automated camera accomplishes just that. They are weather resistant and can be left for days or weeks. In our part of the country we have wildlife all around us. Many of us are made aware of animal activity due to the disappearance of our Tulip buds in the spring or the presence of strange tracks in the yard disguised by snow overnight. Little evidence may remain to confirm who the interloper was. Some people who have acreage and wooded property see little of the wildlife present on their own land. It is a gamble whether the camera is set up in the correct location but that’s part of the fun. In addition, it inherently teaches you about animal behavior; where they choose to travel and why, and whether they are active during the day or at night. It also demonstrates how their behavior changes with the seasons. With practice it is possible to anticipate with some accuracy, where and when an animal will appear. The prices of trail cameras vary widely and I won’t attempt to recommend one model over another in this post but it will include a few tips I’ve picked up since last August. The cameras detect infrared (IR) radiation rather than motion. For this reason blowing leaves and the motion of foliage don’t usually turn it on but any object that gives off heat will trigger the camera at which time it will perform the task you’ve programmed. Digital still photos or video may be recorded with the modern versions. I usually record twenty to twenty five seconds of HD color video. I program it to pause for five seconds and if an IR source is still present, it will record another segment. The night vision capability provided by an IR light source of sufficient quality to clearly show what animal is present but it is not in color. Using an automated camera for purposes other than hunting, gives one a great deal more freedom to be creative. Observing wildlife behavior may be done any time of year and any time of day or night with a trail camera. You will still have the outdoor experience when moving the camera and retrieving the SD card. Don’t forget to take your usual camera along. My camera came with a strap to fasten it to a tree. I’ve learned to position it a little lower than recommended to include smaller animals near by. The camera came with a standard tripod thread. I’ve created a couple of basic wooden supports with a fastener that is a wood screw at one end and a 1/4″x20 tripod thread at the other. One apparatus was just a four foot 2″x2″ stake pounded into the ground and the other was a shorter 2″x2″ fastened to a board that held my auxiliary 12v battery. It was easy to move frequently around my woods not being attached to a tree or a stake. The red plug is connected to a 12v lead-acid battery in an insulated box. Consider buying a small sealed lead-acid battery to dramatically extend the useful video time. My camera normally requires eight AA batteries. I discovered that the area covered by the IR detection is slightly larger than the field of view of the camera lens. Despite triggering a few empty shots, it is a good thing. It gives the camera more time to respond to objects that move quickly. I’ve used bait to attract animals to the camera with marginal success. I found that it doesn’t take much time for squirrels eating corn to fill the camera card with redundant video clips. 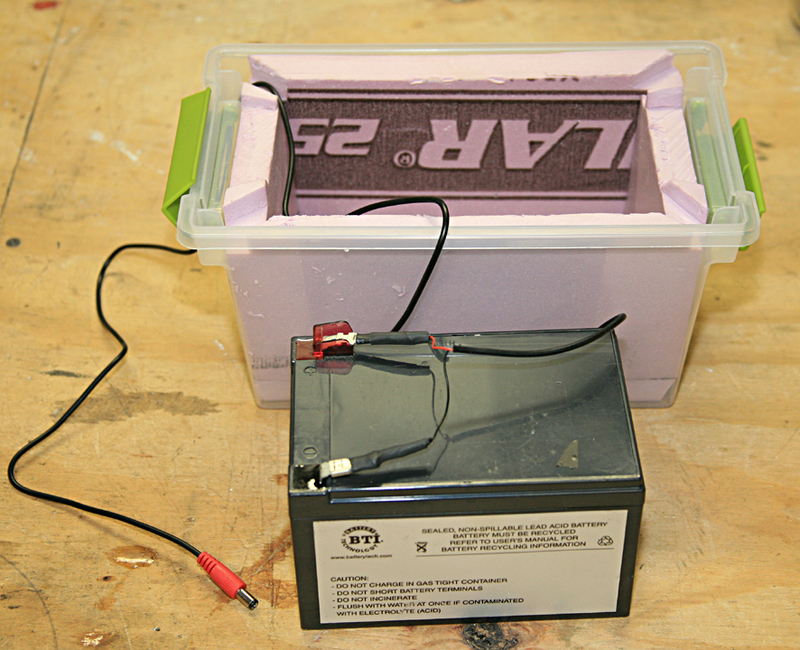 Battery & Plastic container with foam board insulation. I bought a second SD card. This way I make only one trip to the camera and swap cards when I want to leave the camera where it is positioned. Don’t forget to turn the camera back on after changing cards! I tried taking my laptop along to copy image files in the field but found it to be awkward. 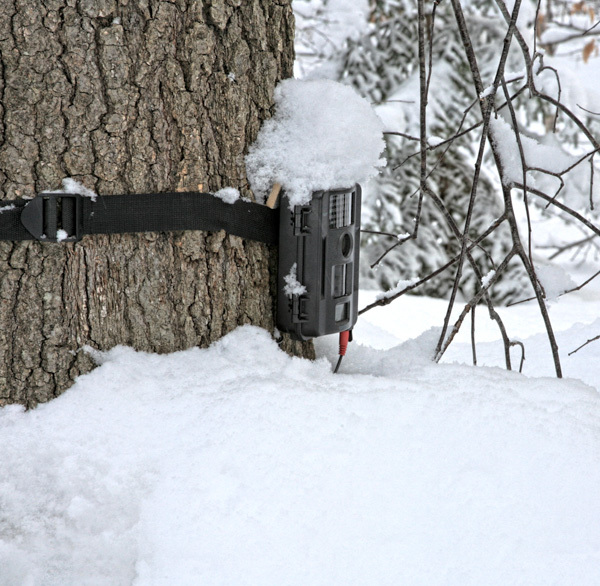 The basic function of trail cameras requires that you leave it at a location that is often unsupervised so care must be taken not to place it where a trespasser might discover it and take it home. If you are in a residential area, make a point of not violating the privacy of other people. For that matter don’t even use the camera in a way that could accidentally record others who would have expectations of privacy. For example if you use it to determine who is stealing gas from your car, don’t have your neighbor’s window in the background. Don’t leave the camera on private property without the owner’s permission. There are probably endless entertaining and practical uses for these automated cameras. It would be interesting to hear about your experiences. Interesting and fun to watch! Love the video! I would like a trail cam for two reasons. 1 – to see what my dogs do out in my yard when I lose sight of them. 1 – Inside when I am gone all day! Great idea. Sort of a nanny cam for dogs. Yes, I have seen this done on YouTube! Very enlightening! I know that there are other creatures out there. I’m aware of a number of foxes, for example but have only caught the merest glimpse of one on camera so far. I keep trying but am getting out-foxed. I may have to update the post this summer. Thanks so much for sharing! I loved watching and your choice of music. I look forward to seeing more. Here in California, the orchards are all in blossom and it is snowing petals. We hope, hope for rain. Be glad for your moisture. Jean, I’m glad that you enjoyed the video. I wish you could send some warmth to us and we could send some precipitation to you.